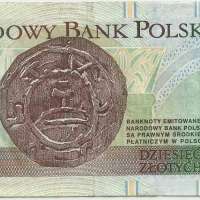 DZIESIĘĆ ZŁOTYCH | NARODOWY BANK POLSKI | WARSZAWA 25 MARCA 1994 r.
The 10 Polish Złotych note is the lowest value złoty banknote and has been used since the redenomination of the złoty in 1995. 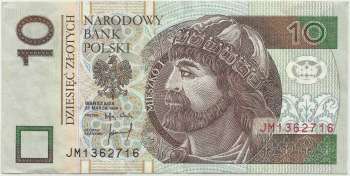 The note is used as the sole currency in Poland, a country with a population of about 38 million. From: Faizal (Eja), given when he visited me in Ibiza (July 2012).